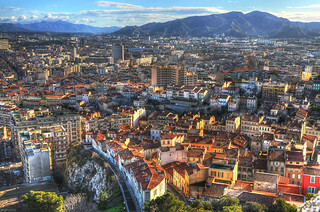 Marseille, France is the capital of Provence region. The rejuvenated southeastern coastal city has experienced a cultural renaissance. 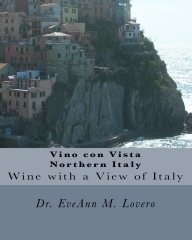 It is known for its sunny climate and lovely coastline. 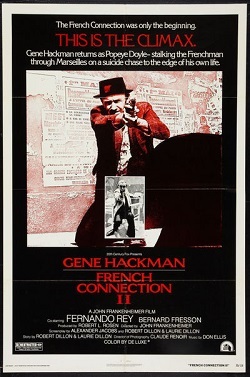 Gene Hackman ‘s Oscar -winning performance in The 1971 French Connection cult-thriller was filmed in Marseilles. Get a City Pass so you can see all the places that Popeye Doyle (Gene Hackman) visited in Marseille. The Pass is available at the Tourist Office; admission to the museums and unlimited public transportation are included. 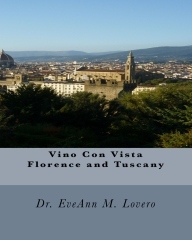 The Vino con Vista horseshoe-shaped Vieux Port is brimming with trendy outdoor restaurants where you can indulge is some flavorfully decadent authentic bouillabaisse. Try La Miramar at 12 quai du Port. Head over to the Hotel de Ville (Town Hall) and take a selfie with the statue of Louis XIV. 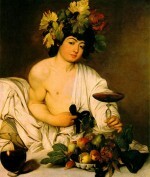 Then check-out the Museum in the Maison Diamantee for all things Provencal. 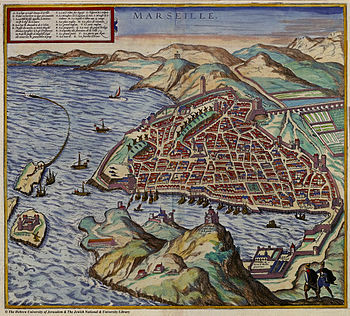 Marseille is the oldest French city. 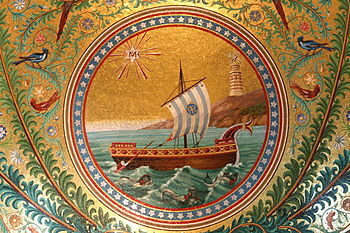 The Phocaeans came there in 600 B.C. 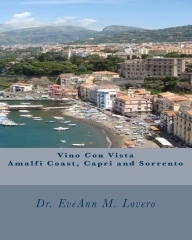 The city is known for its harbor, sunny climate and beautiful coastline. At the Quai des Belges at the port, check out the morning fish market. For a fabulous Vino con Vista, dine at Le Petit Nice where chef “Gérald Passédat presents the Petit–Nice Passédat Hotel in Marseille, a 3 stars gastronomic restaurant with an emphasis oniterranean fish” in an elegant hotel located in two villas from 1910 that overlook the Mediterranean Sea. Go to Michel-Brasserie des Catalans for fabulous Bouillabaisse! Le Bistrot d’Edouard for tapas in the Prado district. Rue Jean Mermoz, +33 4 9171 1652, no website. Open Tues-Sat noon-2pm, 8pm-10pm. Le Café des Épices in the La Panier District. Michelin-rated L’Epuisette overlooking the sea. Vallon des Auffes, +33 4 91 52 17 82, l-epuisette.com. Open Tues-Sat noon-1.30 pm, 7.30 pm-9.30 pm. I can’t wait to try La Table. It is located on the top floor of the MuCEM. • +33 4 91 59 25 92, mucem.org. Online reservations only at passedat.fr. Open Tues-Sat. 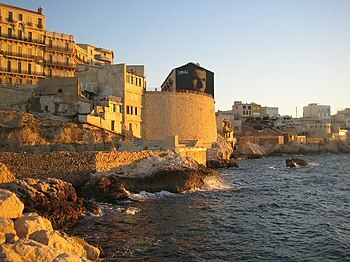 The Old Port is in front of the historic Le Panier district (Old Marseille). This was where the Greeks first laid the foundations of the city about 2,600 years ago. 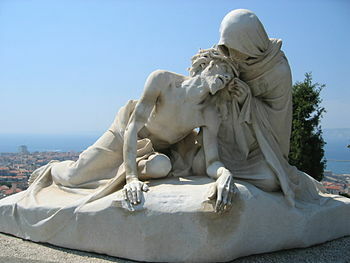 The famous crowned-jewel of Marseilles is the Basilique Notre Dame de la Garde. Take the tourist train from the Old Port; it departs every 30 minutes from 10-12:30 and from 2-6 pm. Perched high above the city, there is a spectacular 360 degree panorama Vino con Vista panoramic view of Marseille from the glistening dome. 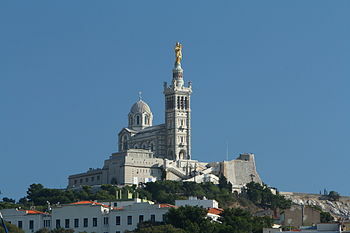 The Roman-Byzantine basilica is built upon the city’s highest hill, La Garde where a small chapel was built in 1214. 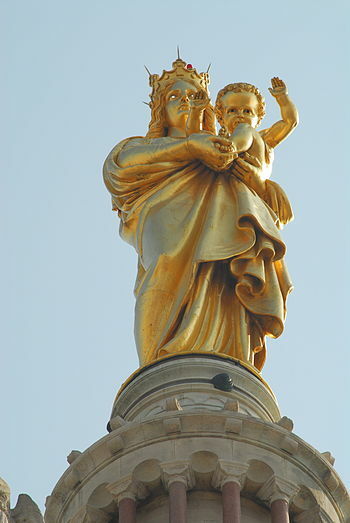 Admire the lovely gilded 30 foot statue of Mary holding Jesus on top of the bell tower of the domed church. 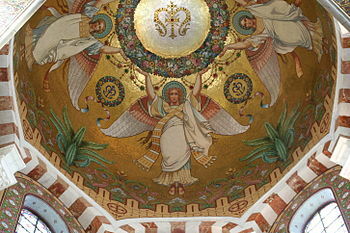 Each year on August 15th, there is an annual Assumption Day pilgrimage to the church. 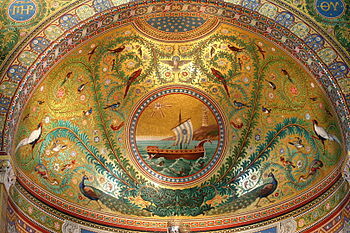 The church is lavishley adorned in marble and cloaked with fabulous murals and mosaics. 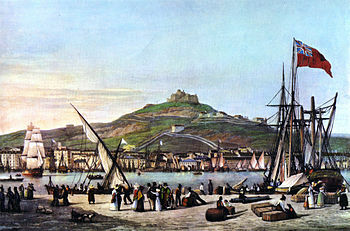 Marseille Vieux Port (Old Port) is where the Greeks landed in 600 BC. It is the hub of the city. 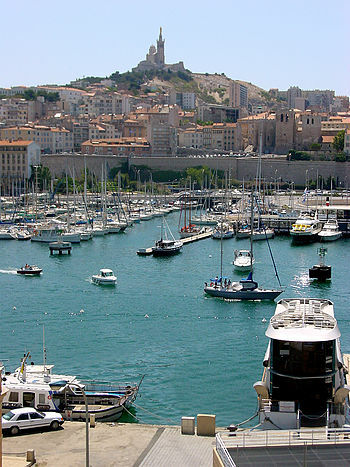 Visit the fish market and the main street of La Canebiere; Marseille’s Champs Elysees. 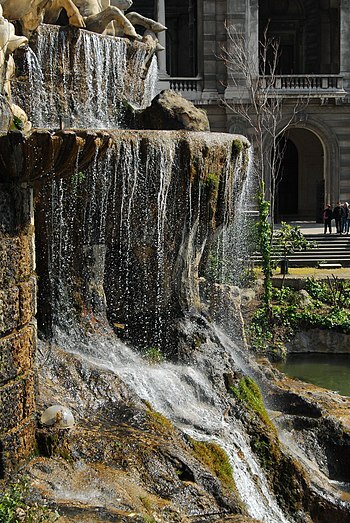 Follow it to the lovely fountains and monument; Palais Longchamp. 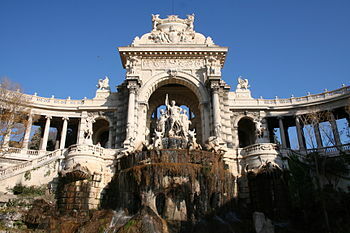 The Palais Longchamp houses the Museum of Beaus-Arts and the Natural HIstory Museum. 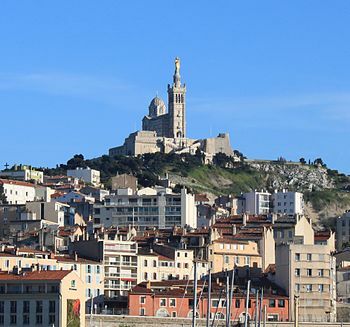 Visit the fortress that was made famous by Alexandre Dumas’ classic 1840s’ novel Le Comte de Monte Cristo (The Count of Monte Cristo). This 16th-century fortress is on an island 2 miles west of Vieux Port. The Iles du Frioul is a collection of 4 islands off the coast of Marseilles. 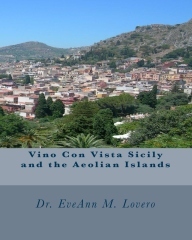 In 1974, the small village of Port Frioul was established as a base for exploring the flora, fauna, beaches and clear-waters of the islands. It has restaurants and around 700 mooring points for boats. The city’s tourist office has plenty of maps and brochures and will make arrangements for tours and excursions. 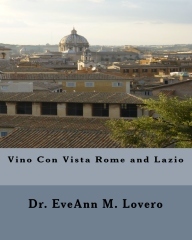 I’m definitely going to the seaside village of Cassis with 5 beaches for my Vino con Vista!. 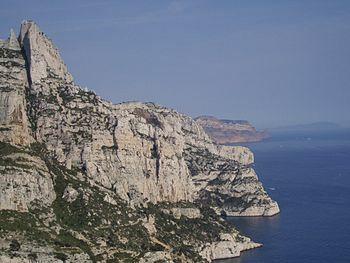 I also want to explore the Route des Calanques.